ROAD TOWN, Tortola, VI - It was a night to personally say "thank you" to all the hardworking individuals who assisted in the recovery process but Dr The Honourable D. Orlando Smith (AL), Premier and Minister of Finance, took the opportunity to encourage persons to call their district representatives to vote yes to the Virgin Islands Recovery and Development Agency Act 2018. 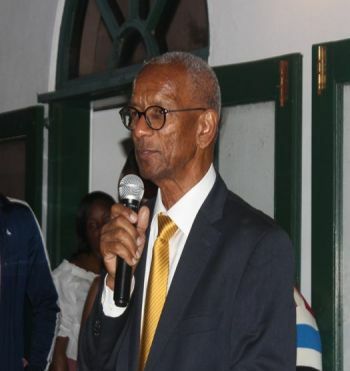 Following the hurricanes of September 2017, many individuals played a significant role in the territory’s recovery, some of whom were officially thanked during an appreciation dinner hosted by His Excellency Governor Augustus J. U. Jaspert aka 'Gus' on Thursday, March 22, 2018, at Governor’s House. Meanwhile, during his short speech, Governor Jaspert said the evening was a time to reflect on how far the territory has come and how much it has achieved and will still be achieving. “It is wonderful to see Government House full of people enjoying and relaxing and connecting with each other rather than seeing Government House full of emergency meetings, royal marines, engineers, crisis teams. Tonight is a moment to say thank you,” expressed Governor Jaspert. In an invited comment, Commissioner of Police (CoP) Michael B. Matthews stated that it was important to recognise everyone who assisted in the recovery efforts as it was not just about one person or just a group. Speaking with a government worker who wished to remain anonymous, they told our newsroom that it was “remarkable” for the Governor to take the time out to show appreciation to persons who were a part of the recovery process, adding that “it was not an easy road”. “Who feels it knows it and we are the people on the ground and we felt it. We have been there and we went through the winds, rain, through the debris flying through our house like never before,” said the government worker. Mr Henderson K. Tittle, President of Mentoring Anointed Leaders Everywhere (M.A.L.E), told our news reporter that the governor taking the time out to appreciate all the workers is an “exciting and nice” feeling, adding that his group assisted in the cleaning up of schools after the hurricanes. "the premier was either blackmailed, coerced or didn't do it on his own will"
Was this a secret party? It’s sad many others like myself wasn’t invited or just hard about it on the news site. I guess it didn’t matter I left the BVI on November 15th 2017 - 13th of December where I attending events and help raise $1.3 millions for (They so-called ) BVI relief drive. The most sick park about those events that used me (I have no idea where that money went or going. What I can say I known 90% of our community who could used that money. So many questions needed to be answered (I’m just not ready to drop the bombshell as yet) oh I think we’re 80 days away from hurricane season 2018. @Gumption - i am so sick of you. Always on the news looking self praise. If you did half of what you say your are doing from the goodness of your heart, i would say you are genuine. You are fake! @sick of you ( Too scared to say who you are? That’s the difference between you and Allington Gumption Creque. Humans like you will never stop the progress of this Rasta youth. Once God got my back all is well. How much you raise for the white man at Necker? Where is the transparency as to where his fundraising went? People all round the world donated to his cause because they didn’t tryst the government but very little has reached Tortola, the biggest and biggest hit island. You are a fake for you would that his offers not he knowing you don’t like him. You’re a fake hiding behind a username. Why are you really upset of Gumpshion? Be honest? Is it’s because he’s trying and doing his best or because you can’t figure how do to it for yourself? I read the post and got his point. Only people like you would be upset. Why won’t you message himself and chat with him? Gumpshion boy keep up the good work fam. The Premier and his two imps M&M need to stop. I am so disappointed in all of them. People taking this thing personal, but it's more than that and they need to see not just now but years from now. I was hoping that they would vote in favor until I really understand what's in the bill. Give it a rest. Dont pass the bill and the BVI will be like Haiti within a year. Watch. I like this governor style. New and Early elections NDP wins again.. NDP 8 seats... Marlin, Alvera and Mitch back benchers again. A take over is the only opportunity these 3 good people have of getting a ministry.. Sad it won't happen because fahie and Frazer are two big crabs in a bucket.. Appreciation is what is the greatest gift on Earth. Obviously we have two parties in one.. This is about leadership.. Quit the secrets. Show Trust and respect.. Get every one involved give everyone a voice and an Ear..Unity is Key. If this storm couldn't bring us together.. Hmmm. What else will..My vote is for help. We need it badly..
As much as I love you Doc I must tell you that you are the cause of this chaos. You not listening to the people. You wsre suppose to done switch up the thing take control even before the floods and the hurricanes. It was too much accusation and whe didnt like it and threaten to resign let them do so..
Just drove through Purcell and heard they have MVW speech on big speakers with a gathering.. Can see they like him and like the Speech...Can't stop MVW..
You made a good point. But he sees this as the only way out to help the BVI. an unselfish act to benefit the People..
90% of those people at that reception did not had the slightest clue what many of us Healthcare workers , who dedicated our lives. We leave our families at home for many days care for the sick and injured; outing our own life at stake. Not even knowing what is happening to our immediate family members. Some faces there, was not even in the country, some refused to assist and said they have their own problems and will not come out in the trenches to assist. Days after did not even show up for work. Lets be real, We have a one sided Government and we need to go back to the mother country.